Ruhuwiko, Matogoro and mshangano wards are among of 13 (thirteen) wards represented within Songea’s Town Council peripheral wards. There are over 37,303 people living in these wards where 1200 are secondary school children with no source of clean and safe water. Potential sources of clean water include (but are not limited to) boreholes, taps, and improved wells. For the residents of Ruhuwiko, Mshangano and Matogoro wards, local wells are the only source of water. Unfortunately, they are used for washing clothes and bathing within local wells is a common practice that often leaves many wells contaminated. Also, the wells are exposed, affording animals the opportunity to pollute the water. Use of these wells for drinking water, which is often not boiled (due to the lack of cheaply available fuels), has led to the occurrence of the diseases like diarrhea, intestinal parasites (such as worms), and bilharzias. The fifth project implementation took place from Nov. 2007 to Jan. 2008 where 7 improved traditional water wells were built ,funded by Help Age International and the sixth water project implementation took place from Sept. 2008 to date where 30 improved traditional water wells have been constructed( funded by Blue Planet Run Foundation-BPRF). In total over 9,200 beneficiaries are benefiting from the initiate since 2003 including 1,500 school children. Even after the construction of eleven (69 ) improved Traditional water wells and ( 1) bore hole in Mdandamo Secondary school the need to expand the project to other areas is especially in secondary schools is great(more than 6 requests from secondary schools and 7 villages have been received by our office). The people who have not yet received such assistance have been zealous in their appeals for support and are ready to contribute their efforts so as to make the project a successful. Construct 3 hand pump for 3 Secondary schools which do not have taps or borehole water sources for drinking water. 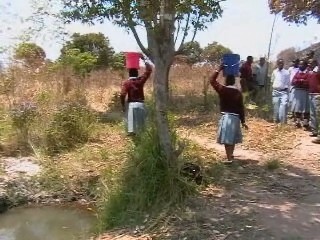 There are over 1500 (where 500 are girls and 1000 boys) people getting sanitation. The skill and knowledge on sanitation and hygiene enabling them to make use of the available water. These is good potential of potable ground water supplies in Songea District from existing water hand pumps constructed in Songea rural district and from existing surveys. Over 500 water pumps were construction in villages at shallow depth ( with maximum depth of 35 m).The depth of water table is ranging between 15 meters to 25 meters depth. There are both hygienic and convenient model to operate. SWN 80 AND SWN 81 model pump set are locally manufactured in Tanzania. A pump set complete with 4”PVC casings Up to a depth of 35 m cost slightly over Tsh. 5,000,000 ( equivalent to $ 4,545.45) due to inflation and raising of transportation costs. In hand pumps constructions we target a borehole yields of not less than 800 liters per hour at shallow depths suitable to service our beneficiaries, presently most of sub-urban secondary schools are not covered by other public water supplies, there fore, the project is going to provide 3 Hand pumps to 3 secondary schools ( Kalembo, Chandarua and Luwawasi Secondary Schools), 1 hand pump in each school. The project will benefit more than 1200 students ( 592 are girls and 608 boys) where Luwawasi Sec. School has 417, Kalembo Sec. School has 505 and 278 from Chandarua Sec. School .The beneficiaries are part of the total population of 37,303 people in three wards where we are going implement the project. 3.. To minimize distance walked by students to fetch some water from 1-2 km to 100 Meters and time from 30 -60 minutes to 10 minutes by January 2009.
? A training session will be conducted to 6 people who are members of WMC on how to manage to perform miner repair , clean, maintain the pump and monitor any problems associated with their functioning. These people, being school community/villagers living in the vicinity of the pump , will be on hand to maintain the wells (two from each hand pump one man and one woman).
? To make the project sustainable PADI will sensitize schools to form Water Maintenance Fund (WMF) which will be formed through their own contribution to ensure smooth maintenance and repair of the pump.
? PADI will make regular monitoring (at least twice per year to see how pump is working).
? Monthly report from the water monitoring committee (WMC) representative who will be attending PADI monthly meeting will help us to know the situation of the pump in each school.
? Well Monitoring Committees (WMC) will be formed in each school consisting of 10 people per pump assigned to properly maintain their pump functioning, managing WMF and daily monitoring of the pump. The fund will be contributed by the school communities aiming at supporting them to manage to maintain and repair their pump. v) Drilling tube well to the depth of 35 Miters with provision for re-drilling and construction of slab and flumes. The work will be done by water technician. viii) Monitoring : Project monitoring is going to be done through participatory way, where PADI project management team including water technician and project coordinator and the Water Monitoring Committees from both three schools will be responsible in monitoring. WMC will be responsible for day to day monitoring of the pump while Project coordinator and water technician will have regular visiting at least twice per year. 1.In project implementation the school community contribute 15% -20% of the project total costs ( usually required to build pump house). A contract to support them is only signed if the community are willing to do such contribution. 2.Wells Monitoring Committees (WMC) formed in each school community always monitor the whole process of well construction to see whether the required procedures followed and building materials assigned at each pump are well used. Monitoring of the pump will be a continuous process even after completing construction. 3.Water Maintenance Fund (WMF) which will be formed through their own contribution to ensure smooth maintenance and repair of the pump. The school community will be responsible to build pump house for saftey purposes. PADI's earlier application on this same project was on the borderline in the last funding round and was not funded. We had asked PADI to resubmit based on comments and thus a comparison is needed. A full review by the same peers is not needed; a couple of eyes will suffice. This is much more comprehensive and clear. The planning, roll out, maintenance, monitoring and evaluation, and WASH education is holistic and considers many of the obstacles that might be encountered. PADIs experience is highlighted here based on their thoughtfullness and thoroughness. I would absolutely give it a better rating! This is a much improved and clearer application from the previous one. We hope the execution goes according to plan.